Again, my apologizes for the radio silence lately! Life has been super busy! But, in the midst of my busyness, I attended the Warrensburg Children's Liteature Festival with my mom and dear teacher friends. We had a blast, as usual! And it seems each year I go, it's like a reunion with old friends. Here is what happened! As usual, we attended the author luncheon on Sunday. The keynote speaker was Susan Campbell Bartoletti, a past Allen County Young Authors presenter and fast friend to my mom (as seen in the pic). In her presentation, Susan talked about writing her first research paper in Mrs. Walsh's high school English class using the research steps found in Warriner's Grammar and Composition textbook. She said how she still uses those same steps to create her non-fiction books such as Hitler Youth: Growing up in Hitler's Shadow or They Called Themselves the KKK: The Birth of an American Terrorist Group. After her presentation, we were off to get our books signed by the authors attending this year. Again, we ran into many authors we have become friends with like Roland and Marie Smith, Ard Hoyt, Sneed B. Collard, Obert Skye, Brad Sneed, Henry Cole, Dorinda Nicholson, Mary Casanova, and Vivian Vande Velde. But then we ran into some new faces this year like Kate McMullan, Leslie Wyatt, Chris Crutcher, and Stephen Johnson. But I was particularly excited to meet Kate Milford, author of one of my most favorite books, Greenglass House. She was incredibly friendly and down to earth! After getting all our books signed and having a fun time chatting with our friends, we headed back to the hotel to figure out our schedule for the next two days. Then lights out after reading some of our new books! Bright and early Monday morning, we headed back to campus to start our day with Susan Campbell Bartoletti. In her presentation, she talked about how writing is similar to catching a fish. Throw out your imagination hook, see what grabs your attention, and reel it in to the end! She discussed how she got into writing by doing the same writing assignments as her 8th grade English students. When they wrote a poem, she wrote a poem. When they wrote a research paper, she wrote a research paper. Sometimes she would share her writing with her students so they could critique her work. Her first book published as a picture book called Nobody's Nosier Than a Cat. Later, her writing interests changed when she became inspired by the history of her husband's grandparents. His grandfather was a young Italian immigrant who, at age 11, had to leave school and illegally work in the coal mines to help his struggling family. His story inspired her to write several books based on his experiences: Growing Up in Coal Country; Kids on Strike! ; and Dear America: Down the Rabbit Hole. Then a sentence in history book about how Hitler rose to power on the shoulders of Germany's youth caused Susan to write the book Hitler Youth. But her research from that book led her to Helmuth Huebener's story about how he became the youngest person on Nazi death row. So she challenged kids to throw out their hooks to catch onto writing, because you never know what ideas you'll reel in. Fantastic presentation! 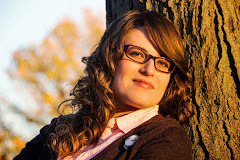 Next we saw a new author this year: Kate McMullan. She focused on her Myth-O-Mania series. Each book is based on a famous Greek legend, but retold from the perspective of Hades. It was a fun presentation to revisit both the familiar and lesser-known Greek myths she bases her books on. Then we were off to see our dear friend, Henry Cole. He thinks we are all crazy to keep revisiting his presentation each year, but he is so entertaining and great with kids...it is worth returning every time! He had a few new books come out recently. These include Spot the Cat (a wordless picture book), Brambleheart, and The Somewhat True Adventures of Sammy Shine. 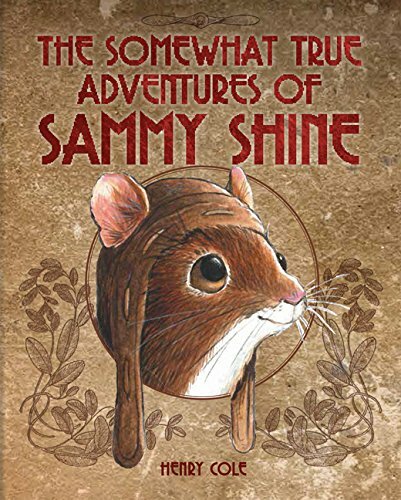 His Sammy Shine book is based on the crazy escapades of Henry, his brother, Jimmy, and Henry's pet field mouse, Sammy Shine. After having lunch with Henry, we headed to another presentation by new author, Chris Crutcher. Chris's books are based on three themes: athletics, comedy, and emotional conflict. He shared why those three components are important pieces in his books. First, sports are apart of his books because he lived in an incredibly small Idaho town where all the boys in his class of 15 kids had to play sports, whether you were good or not. He then related some hilarious high school stories about how he lost his teeth by getting hit in the mouth by a baseball bat and then getting his false teeth knocked out in front of his crush during a basketball game. But with this comedy, he balances it out with emotional conflicts like abuse, neglect, and family issues. He has gleaned those elements from his time as a child abuse and neglect therapist. A fascinating presentation where the group of teenage kids were hooked to every word he said! Quite a feat! Finally, our last presentation was with Kate Milford. She is a fan of the old choose-your-own-adventure books, so she based her author presentation on that concept with the kids picking a topic they wanted to learn more about. The kids in our group wanted to discuss publication. Kate said that in her childhood she thought getting published was a simple four step process: 1) Get Idea; 2) Write Idea; 3) Send Manuscript to Publisher (who loves it, obviously); and 4) Success. Later, she realized it was a incredibly long and tedious list with several different phases involved. But she stressed the importance of writing for yourself because the love you have for your art will come through more in the work you do for yourself than in writing for an audience. It was a fun and engaging presentation where she finished by sharing one of the stories she uses in Greenglass House. After attending our presentations, we met up with Henry, Roland, Marie, and Obert to chat and catch up. Then the four of us went out to eat and go shopping! A fun end to a great day! I'll be posting the final day of author presentations tomorrow. Stay tuned! After Alfred loses both Birdie and Jem to an acting company, he is left with Ned Roach to be his final apprentice. However, Ned is not a bad choice. Ned is enthusiastic and inventive as the pair tackles more official bogling jobs due to their status in The Committee for the Regulation of Subterranean Anomalies. During one bogling job, Ned kills his first bogle, but accidentally destroys Alfred’s legendary spear. 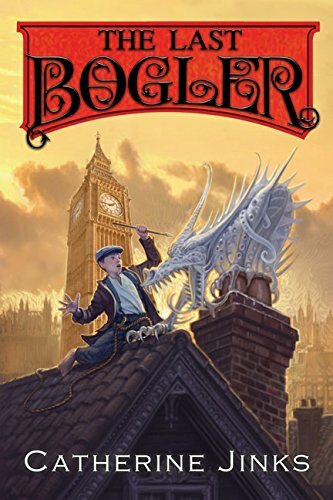 The Last Bogler is a fairly satisfying conclusion to Jinks' bogle trilogy. There are, however, some inconsistencies that seem to deflate the rousing plots and foundational character development Jinks established in her previous books. For example, in the first two novels, both Birdie and Jem felt profoundly loyal to Alfred for giving them a purpose and place in life. In this book, both Birdie and Jem quickly cast aside their devotion to Alfred when the acting company hires them. No consequences were really shown of how that made Alfred feel. Then Jinks’ treatment of ridding London’s society completely of bogles seems almost a copout to quickly end the series. Yet, Jinks is still gifted at creating suspenseful, heart pounding scenes without describing lots of gore. This book was a little more graphic because she describes, in few details, the death of Salty Jack Gammon. At the end of each book, Jinks includes a glossary of colloquial terms that were popular in 1870’s London. Overall, Jinks’ series is still a fun, inventive trilogy for fans of thrilling, monster-based books.